Perhaps the Big 3 US automakers could take a lesson from Tata Motors on this. They’re introducing a micro-hybrid version of their new Nano model (pictured above.) 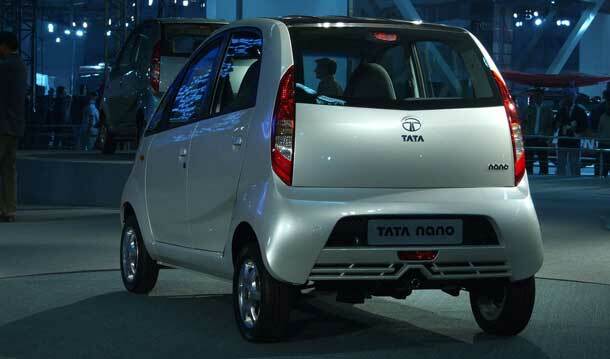 They expect to sell 250,000 units in their first year for a small, fuel efficient vehicle. The price? $2,500. This could be a game changer not only in India, but on the global stage. It’s reminiscent of Henry Ford’s vision for the Model T, cheap, reliable, and efficient. Are Gas Guzzler’s like this headed toward extinction? This morning there are reports that US drivers logged 4.3% fewer miles driven in March than the same period a year ago, that amounts to 11 billion passenger miles. With the average price of gasoline creeping toward $4 a gallon, perhaps the pain is sufficient to cause drivers to reconsider their behaviors, something education and mass transit incentives have failed to do over the past few decades. This is the largest drop in mileage since 1942. This begs the question: When will pain at the pump start to push non-fossil fuel alternatives to the forefront and which will ultimately win? Our bet is on electric vehicles with hybrids as a bridge. The reason is the infrastructure exists, one can imagine their parents/grandparents managing to plug-in a vehicle (imagine them managing a hydrogen or massive pressure compressed air fill up…) and biofuels are a bridge, but not an answer yet as the feedstock is expensive and in competition with food. The outcome will be interesting to see. Soon to be available in the US, providing zero-emission transport around Cannes, France now for less than $0.01/mile. The manufacturer claims a top speed of 100kph (~60mph) and a range of a little over 100 kilometers. With 2 hours of charging time, the batteries recover up to 90% of their charge. The bike also has regenerative braking and a reverse gear to assist in parking since this is a rather heavy (due to batteries) bike. The holy grail of biofuels has been to find a feedstock that doesn’t compete with food (i.e., corn), produce a product that is compatible with existing infrastructure and has great performance, and to discover a low-impact/energy process to produce the product. 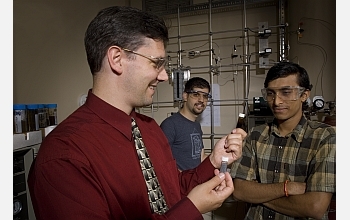 University of Massachusetts (Amherst) BioChemist, Dr. George Huber and his graduate students, Torren Carlson and Tushar Vispute, may have grasped the grail with their switchgrass gas. A process that makes not ethanol, but actual gasoline compounds by combining the cellulose with certain catalysts in the presence of heat to produce the precursors to gasoline and then to run a series of steps that further refines these compounds into gasoline, effectively indistinguishable from the petroleum based fuel used today. While many years from appearing at the pump, this breakthrough has the possibility of transforming the inefficient and increasingly controversial biofuels segment into something completely different. Just How Smart is that Car? While driving around the San Francisco Bay Area this week we’ve had our first sighting of the Smart Car, a small vehicle taking Europe by storm. This is a conventional gasoline powered vehicle in tiny size: 1 liter/70hp engine, 61″x106″, and maximum weight of 2,300lbs. The vehicle gets between 33-41 mpg (EPA 2008) and has a range of around 300 miles with a two people and a little luggage. On the emissions front, Smart Car plays a few tricks like positioning the catalytic converter close to the engine and blowing fresh air into the exhaust system to fully oxidize carbon monoxide and hydrocarbons. It has qualified as an Ultra-Low Emissions Vehicle in California. 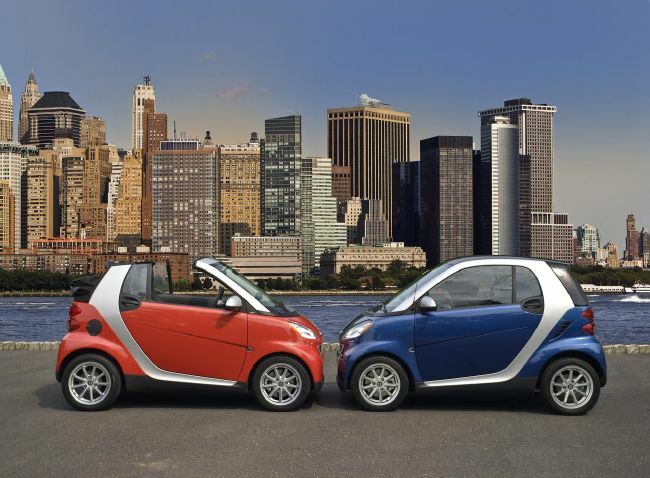 The Smart Car is available in 3 flavors and the MSRP ranges from $12,000-$17,000 depending upon the model and options selected. Can’t wait to get one? Reserve yours here.